Promotions for the upcoming steps are also going on. Gautam Gambhir, the Bharatiya Janata Party leader from the cricketer, held an election rally in Udhampur, Jammu and Kashmir on Thursday. During thi. Promotions for the upcoming steps are also going on. Gautam Gambhir, the Bharatiya Janata Party leader from the cricketer, held an election rally in Udhampur, Jammu and Kashmir on Thursday. During this, he attacked the former state Chief Minister Mahbuba Mufti. Gautam Gambhir said, "Mehbooba Mufti can block me, but can not block this country&apos;s 130 million people. There is a wave in this country with which he is not. There was a wave in the name of development in 2014 and it has become a tsunami in 2019. " In the midst of Gautam Gambhir and Mehbooba Mufti, Twitter War has sparked several times before. On Thursday, Mr. Gurnam told the public meeting in Ramnagar Tehsil of Udhampur district and said that there can never be two Prime Ministers in this country. 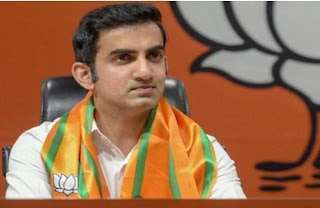 Gautam Gambhir had been receiving the membership of the Bharatiya Janata Party in the presence of Finance Minister Arun Jaitley just a few days before the election. There is also speculation about his contesting from Delhi. Even before this, Gautam has clashed with Mehbooba-Omar on Twitter. On the statement of two prime ministers, Gautam Gambhir had attacked Omar Abdullah, although Omar Abdullah had also reprimanded him. Gautam tweeted that "Omar wants a PM for J-K and I want to walk in the oceans. Omar wants a separate PM for Jammu and Kashmir and I want the pig to fly in the air. Instead of a separate PM, Omar Abdullah needs a little sleep and a cup of coffee after that. If he does not understand it, then he needs a green Pakistani passport. " In reply, Omar tweeted, "Gautam, I have never played much cricket because I knew that I am not good at playing cricket. You do not know much about Jammu and Kashmir nor know about its history.